Two times the co-op games, two times the fun! Things are starting to pick up once more for game releases, so we decided to check out two titles this past Monday instead of the usual one. First up, we dive into Heroes of Hammerwatch and wander around the mines for a bit before deciding we'd rather go to space. So, we hop into our ships and take off in RiftStar Raiders. I never got into the first Hammerwatch game, so much of what has happening in Heroes was new to me. That being said, I like a lot of what Crackshell is doing with this. The co-op is limited to online only at the moment, though the devs have stated that if there's enough interest, they can work on adding local co-op in the future. If you're unfamiliar with Hammerwatch, it's an action-RPG/rogue-lite style game. You choose from one of four (initially) character classes, dive into the dungeon, and gather gold, ore, and experience. The gold and ore can be sent back to town using elevators so that you don't lost it when you die, and can be spent to upgrade the town in order to open up new buildings. It's pretty fun with friends, though it should be noted that any town progression is saved for the host only. 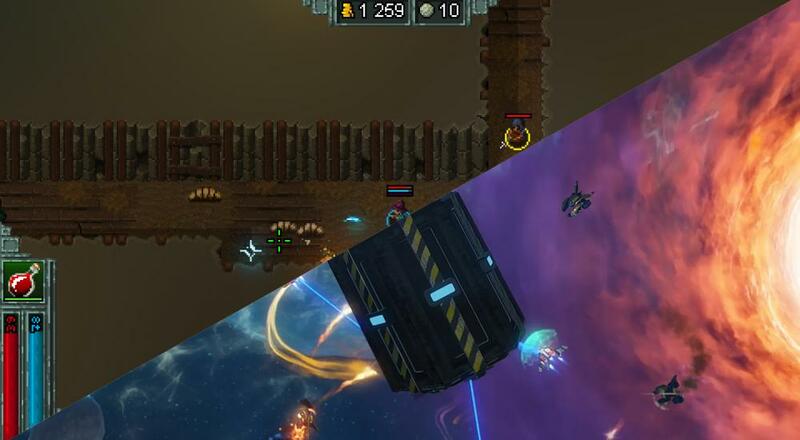 RiftStar Raiders is.... a twin-stick shooter with some RPG/loot mechanics. The core idea is to go out on missions with friends to get money and "perks". Those perks can then be applied to your various ship parts to customize them all and develop different builds. The focus is definitely on the co-op here, and while playing with friends is a lot of fun, there are some aspects to the game that I'm not quite sure about. Specifically, the way the "precision" mode slows you down and how the title wants you to use that mode to navigate through narrow spaces where you can instantly die if you bump into the wrong thing. It may be one of those titles with which I need to spend more time, but that initial impression is not great. Your mileage may vary. Heroes of Hammerwatch is available on the PC and supports four player online co-op. RiftStar Raiders is also available on the PC and also supports four player online co-op, with PlayStation 4, Nintendo Switch, and Xbox One releases planned for some future date.